1. A healthy and productive home church, one that is engaged in a desire to see its local area transformed, sets up a great platform for sending people to other nations. It gives a needed credibility to both the message and the messengers. An established credibility speaks to the unreached people we seek to serve and also boosts the confidence and dreams of those who go. We know the difference Jesus makes in our community and we long to offer this to your community. 2. Local mission provides resources for global mission. Winning people to Christ, discipling and training them is essential to inspiring a new generation of missionaries willing to be sent. Both financial and personnel resources begin with healthy local mission. 3. Training and Experience. Good principles and theology learnt at home will prove invaluable when heading overseas. Issues of faith and practice wrestled within your own environment help the process of contextualising the gospel in a new culture and setting. Do I feel a tension between prioritising local or global mission? Is there a danger in letting one be a cop-out for ignoring the other? How might understanding my own ‘culture’ help in dealing with a different culture? Do I even recognise the challenges of my own culture? 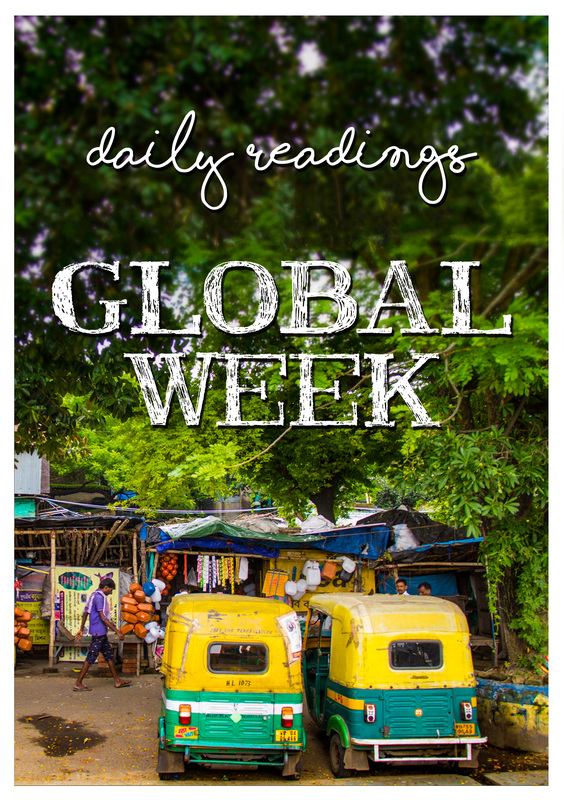 Heavenly Father, challenge me to examine my feelings about mission, both local and global. Thank you that you are not an either/or God but so often a both/and God, making room for all people, multiple gifts, and endless opportunities. Help me grasp something of your heart for all people through this week, Amen. 1. Authenticity counts. If the message of Jesus is good news worthy of taking global, it authenticates the message of our local work. The gospel is not just for us, our city, our culture, but is good news for people everywhere. In other words, Jesus is not a local deity. God’s unparalleled glory and honour is revealed in the praise and worship of every tribe, every tongue, every people; he is the hope of all the nations. It is this God, Creator and Redeemer that we call people to know in local mission, not just the God of our small locality. Global mission endorses that we have something worth exporting. 2. Expanding our perspective. Sending churches not only offer help, but need help. We need to recognise the wisdom learnt by those who have wrestled with taking the gospel across cultures. It is all too easy to develop blind spots within our own culture. We need to listen to our missionaries and accept their help in evaluating and reforming our own local ministry practices. In an increasing Post-Christian Western culture local mission can learn from the perspective global mission provides. ‘Acquiescing to “That’s not the way we’ve always done it” will signal decline in our churches, but “I think there’s something we can learn here” is the sound of doors being opened to new possibilities for gospel flourishing’ -D Mathis. 3. Global is the confirmation of Local. Having a heart for and sending people cross-culturally is the flourishing of local work. It is a sign of healthy maturity. It does not at all mean the work at home is done, but it does point to a healthy outward focus and concern for the other. Conversely, a lack of interest in reaching beyond our borders signals an insular, blinkered or even sick church culture. The gospel is too large to be hoarded; it demands a hearing in every corner of our neighbourhoods and to every people group on the planet. Loving Father, teach us to truly value the good news that is for all people. Help us be open to learn from others, and be quick to respond to your promptings, Amen. Jesus’ interactions with non-Jews are few. For this reason alone they are significant and instructive. Matthew tells of a Roman Centurion coming to Jesus on behalf of his dying servant. As a border town, Capernaum held potential for interaction with Gentiles. As an agent of Imperial Rome, and obliged to swear a pagan oath of allegiance, this man was to a Jewish audience both a political and religious outsider. ‘This bold, subversive, and witty scene brings together two empires (Rome’s and God’s), two ethnicities (Gentile and Jew), and two people with different social roles (centurion and Jesus), yet two people who for different reasons occupy the margins (foreigner, prophet)’ -Warren Carter. Acknowledging his unworthiness (v8) and Jewish prohibitions about entering Gentiles’ homes, the centurion demonstrates a self-deprecating humility. Jewish people considered miracles at long distance to be especially difficult and rare. The centurion however, understanding the nature of authority and ready to place his faith in Jesus’ words alone, does not even demand his presence. Emotion is rarely attributed to Jesus in Matthew’s gospel, but here it says Jesus marvelled or “was amazed” or “astonished”. This outsider is held up as exhibiting “great faith” – a rebuke to the people of God who should have had the inside running on recognising Jesus for who he was. Jesus appears willing to accept humility and faith wherever it appears, commending it without strings attached. Why do you think Jesus gave no demands/conditions to the Centurion? What is the link between humility and faith? Am I open to recognising faith in unlikely places? Almighty God, show us from the example of Jesus what it means to accept all people as you accept them. Make us aware of our judgements and prejudices, and forgive us for indifference towards those different from us. Open our eyes and ears to those who exercise curiosity and faith towards you, Amen. The woman who comes and bows at Jesus’ feet has everything going against her. She is Syrophoenician, (in Matthew ‘Canaanite’ which carried negative Old Testament connotations), an outsider. As a woman it was outside the norms to be in public spaces speaking with men. She may well have been wealthy (Tyre depended on imported food, often leaving only scraps for the rural Jewish peasants), but as the mother of a demonised child she was probably socially ostracized. Altogether, an unsuitable person for a good Jewish Rabbi to be conversing with. Mark sets the story immediately following Jesus’ discourse on impurity. His dealings with the mother reveal his openness to those others considered unclean. Despite her disadvantages she begs Jesus for help. The language is of a continuing crying out that will not cease. Jesus’ words may seem harsh but they do not need to be interpreted as such. He is conscious of his mission to the Jews and that the time is short. The woman does not take offence, and in fact acknowledges the priority of Israel in salvation history. She also glimpses the purpose of Israel’s mission to be a blessing to the nations. The disciples are slow, the woman quick witted. Jesus commends her insight, her persistence and her faith. Again there is no demand to follow, convert or jump through hoops. Faith brings the reward she seeks. Here are hints of the trajectory of God’s plans. What stories might this Gentile mother have spread to her neighbours? Why do we prioritise behaviour while God seems to prioritize faith? Do we make faith difficult by expecting external change before acceptance? Are we ready to look for cross-cultural opportunities just over the fence? Heavenly Father, thank you for these examples of your compassion for the outsider, the stranger, the needy. May we become a community known for our welcome and our care, Amen. its lands and its peoples. and offer all the hospitality you have already given us. We are thankful for their critical presence. We ask that you accompany them as they accompany others. to feed those who are hungry and freedom for those who hunger for justice. that separate us from each other and You. Your good news of liberation for all. to do justice, seek kindness, and walk humbly with You. Amen.